This week, we played the dice version of the 2003 Spiel des Jahres, Alhambra. However, the only real similarities with the board game are the scoring mechanism and the theme. 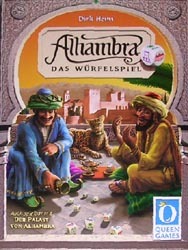 Alhambra â€“ The Dice Game was designed by Dirk Henn and published by Queen Games. The game plays over five rounds with a scoring after the 1st, 3rd and 5th round. Victory points are awarded for majorities of allocated buildings (very similar to the original game). To get the buildings you roll 8 dice each showing the six building-symbols. Each player has 3 rolls on his turn to get as many of one symbol as possible. The results of the dice rolls from every player are marked on the game board so everybody can compare his dice rolls with those of the other players. Once each player has placed three markers (in a 5 or 6 player game), the round ends. After a round is completed, for each building type, the player with the highest dice-roll can choose between 2 buildings of the respective category or 1 building and a special counter giving a certain bonus. (Bonuses can be: additional 1-3 VPs, extra dice-roll, exchange one building, determine Starting player, etc.) The second best player in that category will get the other reward. After round #1, #3 and #5 the majority in each building category is awarded VPs. The player with the most VP’s after the fifth round wins the game. This would have been a fun dice-fest if it had lasted 20 minutes but our game took way too long and I think everyone was relieved when it ended. After the first couple of rounds, once people had committed to which buildings they were after, the main decisions were already made. Your fate was then down to whether or not you were lucky enough to roll the right colours. Although seeing someone fail to get the dice rolls they really needed was fairly amusing, it just didnâ€™t make up for the tediousness of the rest of the game. Nige won this by getting ahead on a couple of the high scoring buildings and then just protecting his lead. After the disaster that was Alhambra â€“ The Dice Game, we only had time for a short game to finish and we picked this push your luck card game from Reiner Knizia, which is published in Germany by Piatnik. 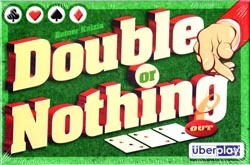 Double or Nothing uses a deck of 66 cards made up of 59 suit cards and 7 bonus cards. The suit cards show between 1 and 4 suit symbols and the idea is to lay a chain of cards with one or more suit symbols appearing on every card laid. On a playerâ€™s turn, he can decide either to cash out or to add another card to the chain. By cashing out, the player banks the points from each symbol still in the chain from first card to last but then drops out of the current round. If a player lays a card and the symbols on it continue an unbroken chain, the player remains in the round. However, as cards are laid the chain for certain suits will become broken and, if the card you laid breaks the chain for the final unbroken suit, you are out of the round and score no points. The twist in the tail is that, if you are the last player in the round, you are forced to play two more cards: if they succeed in continuing the chain you then score double points; otherwise you score nothing. The bonus cards add points to the current chain but, if two turn up in a particular round, the round ends immediately and those still in go away empty handed. Also, once the seventh bonus card is revealed, the game ends immediately and whoever then has the most points is declared the winner. This is a very simple game with more than a passing resemblance to Zirkus Flohcati (another Knizia game) that plays quickly with a fair bit of tension in deciding whether to carry on or bank your points. It also appears to be a close cousin to Diamant, which is a great push-your-luck game. In our game, Mark K struck out with an early lead after a successful double attempt. However, it turned out to be short-lived. As we were approaching the bottom of the deck, I cashed out early in a round, hoping that the seventh bonus card would appear before anyone could overtake me. However, it wasnâ€™t to be and Mark G raced past my score just before the final bonus card was revealed. Well played. Just a reminder that the second UK Games Expo is this coming weekend on 31 May and 1 June 2008. Chris and I will be there on the Saturday and will be looking toÂ try outÂ a few of the new releases: Monastery and Tinner’s Trail being the main ones in which I’m interested. Rumour has it that Eric Martin of Boardgamenews will be there so I’ll be hoping to catch up with him while I’m wandering around. (OK so it’s not rumour, Eric emailed me to tell me he’ll be there). This Friday’s session of the Shrewsbury Boardgames Club (30th May 2008) will be at Garry’s house. The two I’ve played (Stone Age and Keltis) are both good choices and I expected them to appear on the list. The other three I don’t know too much about although the Kramer game looks too abstract to be a likely winner. Agricola didn’t appear as a nominee but that is not a surprise as it looks a bit too complex for your typical family game. It did, however, pick up a special award. The winner of the SdJ is announced on 30th June 2008. 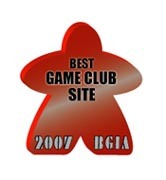 … that Trickylight won best Game Club Site in the 2007 Board Game Internet Awards. Well, Eric Martin has just sent me a really snazzy badge to prove the fact. This means I need to get back on top of the game reports (as we’re a couple of weeks behind).Â I don’t want toÂ be a contender for the 2008 worst game club site. Just a reminder that this weekend, the 19th Beer and Pretzels game weekend will be held at the Town Hall, Burton on Trent, Staffs. The fun starts at 10 a.m. on the Saturday and runs until 10 p.m. that day, with the Sunday hours being 10 a.m. until 7 p.m.
Further details can be found on the Spirit Games website here. 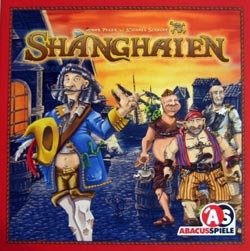 Last night, Jan and I tried out Shanghaien, a Michael Schacht and Roman Pelek design that was published by Abacus. What an excellent little game it is. Strictly two player, it is a game about recruiting sailors of various nationalities to join your crew. Each of the eight rounds involves a struggle over six sailor cards (or special action cards) with each card corresponding to the numbers 1-6 0n a die. The player rolls two dice and picks one to allocate to the card matching that number. When a player chooses to, or is forced to, end the round, whoever allocated the most dice to a card wins that sailor/special action. Ties are broken by the value of dice allocated to neighbouring cards, which adds an extra tactical consideration to picking which die to use during the round. After eight rounds, sailors in each nationality are compared and the player with the stronger sailors in the nationality gains VPs equal to the value of the weaker player’s sailors. However,Â if you have a monopoly of sailors in a nationality, you score VPs matching your own strength. There is plenty to weigh up each turn to make the game interesting but never too much to keep track ofÂ , which is ideal for the more casual gamer. The game plays to a finish in 20-30 minutes and seems great fun. This should get plenty of play around here.